DNA, as the “brain” of the cell, is ultimately in charge of every process...The DNA that's neatly tucked inside each cell is something magnificent, a complex combination of chemicals and proteins that holds the entire past, present, and future of all life on our planet. A statement this outrageous is not very common, but it is very common for writers to inaccurately describe DNA. One very common claim is that DNA is a blueprint that lays out the complete specification of the human body. Another common claim is that DNA is a recipe (or a library of recipes) for making an organism. It is also sometimes claimed that DNA is like a computer program for generating our bodies. But such statements are not warranted by the facts. Judging from the facts, we must conclude that while DNA uses a code of symbolic representations (the genetic code), DNA is not a blueprint for making a human, is not a recipe for making a human, and is not a program or algorithm for making a human. The facts indicate the DNA is not anything close to a complete specification of an organism, but that DNA is instead something much simpler, mainly just a kind of database used in making particular parts of an organism. Below are 6 reasons for thinking that DNA is neither a blueprint nor a recipe nor a program for making human beings. Reason #1: The “language” used by DNA is a minimal feature-poor language lacking any grammar or capability for expressing anything like a blueprint, a recipe, a program or an algorithm for making a human being. First, let's look at the different ways of specifying a three-dimensional object, and then look at whether any such way could be used by using DNA. There are two ways in which you can create a specification for building something that will exist as a three-dimensional object. The first way is the blueprint approach, in which you don't specify the steps that must be taken to create the object, but merely specify how the object will look once it is constructed. You can create a kind of blueprint by creating a drawing or image that will specify how the completed object should look. Alternately, you can specify three-dimensional coordinates for each of the parts that will make up the final object. The latter approach is used by video games and in the fancy special effects used in movies. A video game may store a 3D object as a series of 3D coordinates, and then use such coordinates to construct the object virtually. A different approach for telling how to make a three-dimensional object is what we may call the recipe approach or the algorithm approach. When this approach is used, you merely specify a list of ingredients or parts and a list of steps or operations that will be taken using such ingredients or parts. For example, you might specify steps for making a house without using any blueprint for the house. You could specify a list of building materials and a list of exact operations to be performed on those building materials – a set of instructions. If the set of instructions was sufficiently detailed, they might be sufficient to produce some exact type of house. But the “language” used by DNA is a minimal type of language that lacks any capability for using either of these approaches. Instead of being a rich language capable of great expression, the language used by DNA is pretty much the poorest, most “bare bones” type of language you can imagine. It's a language unsuitable for purposes other than stating lists of chemicals. Let's look at exactly how the “language” of DNA works (and I used the word “language” in quotation marks because the expression capability is so limited that it may be an exaggeration to even say that it uses a language). DNA is a molecule containing many nucleotide base pairs, as shown in the diagram below. The base pairs can be either adenine, guanine, cytosine, thymine, or uracil. Combination of these “letters” of the DNA alphabet are used to represent particular amino acids, which are the building blocks of proteins. You have to look at a diagram of the genetic code to understand how particular combinations of these base pairs stand for particular amino acids. But you absolutely could not specify something like a plan for making a building, a complex machine, or a complex 3D object consisting of many parts existing in different coordinates in three dimensional space. And so it is for DNA. The “language” used by DNA is effectively 24 words or fewer. Twenty of those words are nouns, each an amino acid. The only verbs are something like the words “start” and “stop,” and possibly also “use” and “ignore.” I include those two words because scientists say that particular genes can be turned on or off. The table below gives a schematic view of the DNA language. Strictly speaking the only verbs supported are “start” and “stop,” but I have also added “use” and “ignore” to cover the idea of genes that are switched on or switched off. State any one of the twenty amino acids in the list above. Repeat step (1) any number of times. lysine, proline, lysine, valine, serine, tryrosine, stop. When you try this a few times, you may realize the very small powers of expression of this tiny little DNA mini-language. Consider the “blueprint” approach of specifying a three dimensional object. A piece of DNA cannot specify that some particular body part should exist at some position in 3D space, because the DNA has absolutely no way of expressing positional coordinates. There is no way to say “behind,” “below,” “above,” or “in front of” using DNA, nor is there any way of specifying how much farther something might be behind, below or above something else. Not only is DNA language incapable of expressing where a nose should be located, the language also cannot even express the idea of a nose. All that DNA can do is to specify some proteins that might be used by the nose. Even that specification is incomplete, because DNA only tells which amino acids are used by a particular protein – it does not specify the shape of a protein (proteins typically have extremely complicated 3D shapes involving lots of folding and twisting). 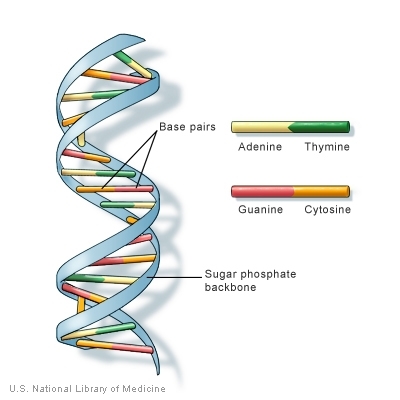 Such ideas cannot be expressed by the “bare bones” language of DNA, which can only express lists of amino acids used to make proteins or nucleic acids. It seems clear, then, that the language limitations of DNA mean that it cannot be something that expresses a blueprint for a human being or a recipe for making a human being. DNA is not a program for making a human. Reason #2: Even if the “language” used by DNA had the capability of expressing a blueprint or recipe or program for making a human, there would be nothing that we know of capable of interpreting such instructions. An important fact to consider is that a list of instructions is not sufficient by itself to cause something to get done. You always need some sophisticated agent smart enough to interpret the instructions and execute them. We know this is true for something like a food recipe. Obviously an apple pie won't get cooked just because you have an apple pie recipe on your table – you need a human smart enough to read those instructions and execute them. But what people sometimes forget is that something similar holds true even for computer code. If I write a computer program in some new language called Lingua, just putting that source code on my computer will never cause the program to run. I would also need to have on my machine a highly sophisticated piece of software called an interpreter, something that is reading each of those instructions, and causing some corresponding action to be taken. What is the relevance of this to DNA? The relevance is that not only do we know of no capability that DNA's “language” has for specifying anything like a three-dimensional blueprint or an algorithm for making a visible three-dimensional object, but we also know of no capability in the body for interpreting such instructions if they existed. So in order for DNA to work as a program for generating the human body, we would need two things: (1) some capability by which DNA could express complex instructions for making visible three-dimensional objects (which are apparently completely beyond the limitations of DNA's feature-poor, minimalist language); (2) some other capability by some other unknown agent capable of acting as a highly sophisticated interpreter of these complex instructions. Neither of these things is known to exist. It would seem, therefore, that the idea that DNA acts as a program or algorithm for generating the human body is not just impossible, but doubly impossible. Reason #3: Despite cataloging the entire human genome, and exhaustively analyzing it, scientists have not discovered any part of DNA where a blueprint of the human body or a recipe for making humans is stored. The Human Genome Project was a federally funded project that completed in April, 2003, after cataloging the entire human genome (all parts of DNA). It was followed up a federally funded ENCODE project designed to further analyze DNA. The results were gradually released over the next decade. Now with all this exhaustive study and analysis, we would expect that if there existed such a thing as a blueprint for the human body in DNA or a recipe for making the human body in DNA, that it would have been discovered. But no such thing has been discovered. We have discovered in DNA mainly just a list of chemicals used in constructing proteins, not anything like a specification specifying the body plan of humans or how to construct the intricate machinery of the human body. I may note that the “homeobox” supposedly having some relevance to the human body plan is only 180 nucleotides long (the equivalent of about 60 words in the DNA language). This is millions of times too small to store anything like a plan for the human body. Genes code for proteins and RNAs. They don't code for brains, limbs or body plans. Yet many scientists insist that Hox genes, and other transcription factors, are responsible for "laying out the floor plan" of the organism when all they are observed to do is activate genes in already established segments of the developing embryo. We have known this for 20 years. So why are the 39 Hox genes still portrayed as determining the geometry of anatomy when all they do is bind to DNA and RNA polymerase to affect gene expression in ontogeny? The meager and murky evidence regarding hox genes notwithstanding, our scientists have not found any clear evidence that DNA stores a blueprint for the human body, a recipe for the human body, or any type of program or algorithm like a body plan. If DNA stored such a thing, there would be abundant evidence of it. In the short video below, Jonathan Wells (a PhD in molecular and cell biology from the University of California at Berkeley) states very clearly that DNA does not map out a body plan. He states “the body plan, as far as we know, is not in the DNA” (0:33), and states that DNA is “not a blueprint, it's more like a parts list” (1:40). Reason #4: If DNA stored a human blueprint or human recipe or body plan, humans would have a much larger DNA than simpler organisms; instead, the opposite is often true. If body plans are stored in DNA, we should expect that the size of an organism's DNA should be proportional to the size and complexity of an organism. For the same reasons that the blueprints of a skyscraper use much more paper than the blueprints for a house, under a “DNA has the body plan” assumption we should think that the human DNA is much bigger than the size of, say, any flowering plant. But astonishingly, the opposite is true. The chart here shows the relative size of the DNA in different organisms. We see that the size of the DNA (in base pairs) in mammals is much smaller than the size of the DNA of many amphibians and flowering plants. We see on this logarithmic chart that the DNA of some amphibians and flowerings plants holds ten times more information than the DNA of humans. A related comparison is the number of genes in the DNA. According to this link, rice has between 32,000 and 50,000 genes, while humans have only 20,251 genes. That's the opposite of what we would expect if DNA stored body plans. Reason #5: The DNA size of humans is insufficient to be a blueprint or recipe for the human body with all its complexities. Astonishingly our biologists have sometimes assumed that DNA is a complete specification for constructing a human body, but I have never once read a biologist consider whether the information size of DNA is sufficient for such a task. The idea that DNA can store a complete specification for a human being will obviously make no sense if our DNA molecules are not big enough to store such a specification, just as it will make no sense to assume that a postcard can store the names of all members of a club if the club has many thousands of members. It has been estimated that a DNA molecule has an information size of about 700 megabytes. This is not big enough to store a complete blueprint, algorithm, or program for creating a human being. If you use the uncompressed RAW files used in cameras, it will take about 8 megabytes to store a high resolution photo. This means human DNA has an information size needed to store about 100 high-resolution photos uncompressed. This is not big enough to store a complete specification for making the human body. A recently introduced CT scanner requires 320 scans to map a human body, each scan equivalent to such an 8 megabyte photo. But consider also all the microscopic functionality that would need to be specified, and all of the microscopic details. It would seem that it would require many gigabytes to store a complete plan for building a human, not just 700 megabytes. This is the weakest of my six reasons, so I'll discuss it only briefly. All parts of DNA are subject to mutations in which random changes occur because of things such as copying errors and cosmic rays hitting part of DNA. If DNA stored the human body plan, it seems that we should expect to see weird examples of “scrambled humans,” such as people born with eyes on their cheeks, people with noses on their chins, people born with ears on their foreheads, and so forth. But we don't see such abnormalities. Genetic mutations can produce serious abnormalities, but the human body seems to be implemented with astonishingly fidelity, more so than we would expect if the body plan for humans was stored in DNA subject to mutations. The reasons discussed above strongly argue that DNA is not a blueprint, recipe or specification for making a human being. Does this mean that there is nothing like a body plan for making a human? Not at all. Such a plan must exist somewhere. But we don't know where it is located. It does not exist in DNA. Widely described as “the secret of life,” DNA must instead be only one secret of life. There must be some other equally great secret that we have not discovered. This undiscovered secret – the unknown location of the specification for making a human being – is the gigantic missing link of biological life that we have not discovered. Where might such information be stored? It might possibly be stored somewhere else in the body, or it might be stored outside of the body. It may well be that the answer lies in some field or force or influence or information system entirely unknown to us. This gigantic missing link of life can most mysteriously be seen at the moment of life's conception. Once a tiny female ovum has been fertilized by a sperm, how does the fertilized ovum know how to turn into a human baby, rather than a million other possible forms? There is absolutely not in DNA any mechanism by which an ovum or an embryo can look up a list of instructions to follow based on its age. An ovum or an embryo doesn't know how old it is, and doesn't know where to look in DNA to look up appropriate instructions; and DNA does not have instructions organized by biological age, which might be looked up by some ovum or embryo that knew its age. DNA has everything written in a language of about 22 words in which 20 of those words are amino acids – not something remotely suitable for stating any instructions other than protein or RNA assembly instructions. The idea that embryo development is controlled by a genetic program is inconsistent with the biological evidence. Embryo development requires far more ontogenetic information than is carried by DNA sequences. The problem of how a fertilized ovum can progress to a baby is called the problem of morphogenesis. It is an unsolved mystery that modern biology has not given enough attention. The complete answer must involve much more than just DNA, and we have every reason to suspect that it involves something utterly mysterious that we know little or nothing about. Until this mystery is solved, we cannot plausibly claim that we understand either life or evolution. J. Maynard Smith (1983) has written that "although we have a clear and highly articulated theory of evolution, we have no comparable theory of development." I would turn this statement around somewhat and say that until we have a general theory of development we are unlikely to be able to derive a complete theory of evolution. Correct, and you could just as easily change that phrase "complete theory of evolution" to "plausible theory of what drives evolution." Although genes obviously play a role in development, knowing the genetic make-up of an organism does not allow us to understand the mechanisms of development—we may know that certain genes impart particular properties to certain cells, but how this then leads to tissue-level behaviour cannot be addressed by genetics. That is basically a fancy way of saying that a fertilized ovum does not become a baby by following a body plan stored in DNA. On page 26 of the recent book The Developing Genome, Professor David S. Moore states, "The common belief that there are things inside of us that constitute a set of instructions for building bodies and minds -- things that are analogous to "blueprints" or "recipes" -- is undoubtedly false." DNA only codes for the materials from which the body is constructed: the enzymes, the structural proteins, and so forth. There is no evidence that it also codes for the plan, the form, the morphology of the body. To see this more clearly, think of your arms and legs. The form of the arms and legs is different; it's obvious that they have a different shape from each other. Yet the chemicals in the arms and legs are identical. The muscles are the same, the nerve cells are the same, the skin cells are the same, and the DNA is the same in all the cells of the arms and legs. In fact, the DNA is the same in all the cells of the body. DNA alone cannot explain the difference in form; something else is necessary to explain form. An evolutionary biologist notes that "the long-held belief that genes are the unique determinants of biological form in development and evolution has been challenged by an extensive number of commentators." Among these "extensive number of commentators" are the people mentioned above and the authors of this scientific paper, who note that "gene expression patterns cannot explain the development of the precise geometry of an organism and its parts in space." Describing conclusions of biologist Brian Goodwin, the New York Times says, "While genes may help produce the proteins that make the skeleton or the glue, they do not determine the shape and form of an embryo or an organism." Massimo Pigliucci (mainstream author of numerous scientific papers on evolution) has stated that "old-fashioned metaphors like genetic blueprint and genetic programme are not only woefully inadequate but positively misleading." Neuroscientist Romain Brette states, "The genome does not encode much except for amino acids." It is now clear that the genome does not directly program the organism; the computer program metaphor has misled us...The genome does not function as a master plan or computer program for controlling the organism; the genome is the organism's servant, not its master....Metaphorically, we can think of the genome as akin to a list of words, a vocabulary, which can be used to build and express a meaningful language; like a vocabulary, a genome by itself has no functional meaning. The genome is thus akin to a toolbox of DNA sequences that provide molecular tools as requested by the internal state of the organism and the state of the environment. One's genes cannot explain one's being: an organism is the expression of a dynamic and ongoing interaction between the state of its environment and its internal state, which includes its past history and its toolbox of DNA sequences.